In 1729 Jonathan Swift floated A Modest Proposal for solving Irish poverty under English rule: allow Irish parents to sell their children to the English as food. The Irish would no longer be poor, and the English would have enough to eat. I have my own Modest Proposal: billionaires must run the country for the duration of their lives, and upon their death, the responsibility will pass to their children for their lives, ad seriatim. If they or anybody in the line of succession refuses the responsibility, then their wealth will be confiscated by the government. Governance used to be by the most physically imposing or charismatic, who seized lands and charged rents from the inhabitants. Then it was by the monarchs who inherited these kingdoms from their physically imposing, charismatic ancestors, and doled subordinate fees out to lesser lords who willed these estates to their children in turn. The merchant class did not rule. Then we decided that “the people” would rule. 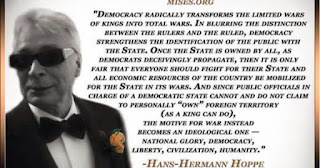 "The people" seized the right to rents from the monarchy in the usual way: by superior violence, for which the people subsequently substituted ballot boxes. In other words, instead of firing the rifles, we just count up who has the most of them and agree to go home instead. The best example of this distortion of the democratic process is Eric Cantor, who got tossed out on his ear by voters repulsed by his support for Open Borders. Upon being fired by the voters, Cantor promptly landed a $3 million dollar a year job. In sum, the prospect of being voted out of office is no longer a threat to the ruling class, who receive substantial back-loaded bribes in the form of speaking fees, "foundations," and other sinecures. 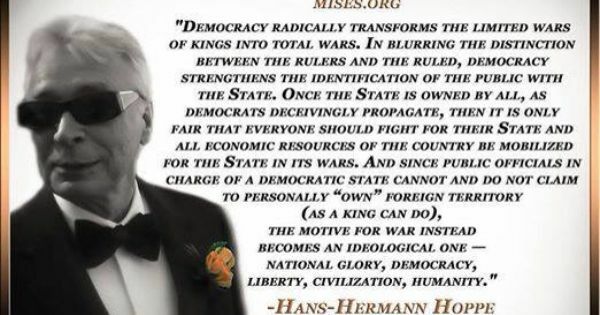 We live in an oligarchy dressed up in democratic trappings. This is of great benefit to the oligarch puppetmasters, who might otherwise find their own necks on the line for the destructive policy choices they bribe legislators and executive branch officials to follow. Therefore, get government aligned back with ownership incentives. Since the current metric is wealth rather than physical prowess and charisma, then we’ll just stick the wealthy with running the place, or their wealth will be confiscated so it can’t subvert the people. Another unusual (but equally unlikely) proposal I have heard to combat the same problems is repealing Civil Service Reform and letting the Spoils System come back. In theory, low-income office-seekers would then replace corporate donors as the main source of party strength and organization. It would also make it possible for voters to meaningfully change government policy, simply by firing all the civil servants who were committed to the old policies. That might have been workable decades ago, but at this point, I suspect America's ethnic fragmentation is too far advanced for this to lead to anything other than a naked system of armed robbery along ethnic lines. I also suspect that civil servants are the glue holding together a lot of marginal communities with low social capital; upending their lives every four years would have a lot of ripple effects. The post makes an excellent point. Our western Éminence grise wields ludicrous influence without any of the bothersome public accountability that should naturally attach to it.